What To Look For When Buying Home Theater Seating? There are many things to consider when buying home theater seating — and if you already began looking around, you may have a lot of questions. What style seats do I want? How many seats will fit in my space? What configuration and color do I want? Do I want individual seats, or love seats — or even a sectional? How much will this cost me? These are some of the questions you will need to answer in order to find the perfect solution for your home or project. This post will attempt to answer these questions so you can make an informed purchase. As always, if you have questions not answered in this post, just leave us a note in the comments below. Home theater seating styles are as varied as any other type of home seating. 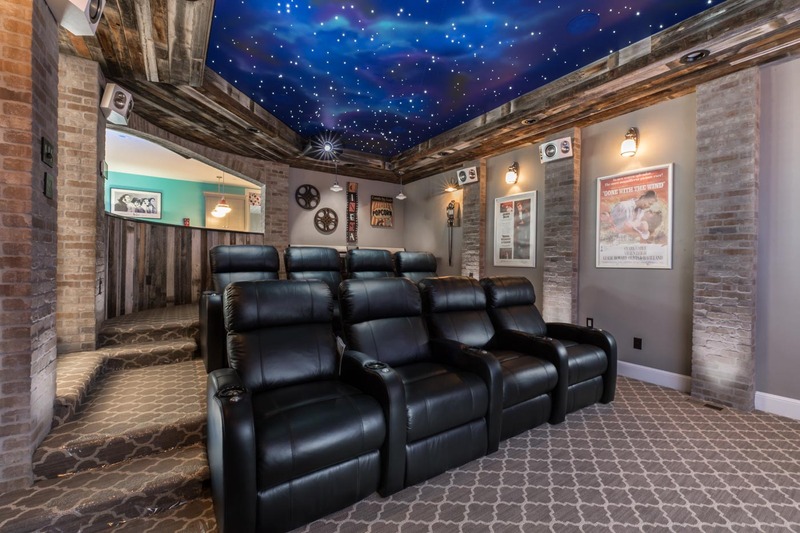 From the traditional home theater look of black leather to rustic charm with custom stitching and nail heads to ultra-high end sectionals with modern esthetics and full motorized controls. Leather is the most common covering. And it doesn’t have to be black. Octane Seating offers a range of color leather for their base models and even exotic embossed leathers for their custom models. Many manufacturers offer a wide range of ultra suede and fabric options too. High-end manufactures like Fortress will even use fabric sent in by the client. Cineak, based in Belgium, also carries designer home fabrics like Armani Casa. What seating configuration is best? Gone are the days of strict rows of individual seats. Its become increasingly popular to mix your rows. One row is individual seats, while another row is made of love seats. Maybe the front row is chaise style. More and more, manufacturers are integrating the motorized functionality of traditional home theater seats into living room style sectionals and calling it ‘Media Seating’. This way you get all the bells and whistles in a form that fits your great room. Please leave us questions in the comments. How much does home theater seating cost? Home theater seating is priced per seat, even if you are planning on a row of 5 seats, the price is still per seat. This applies to love seat, couch, and sectional configurations too — prices are still per individual seat. Prices can run from $600 for budget-friendly options to several thousand dollars each for ultra-high-end custom seating — then there are pricing options all along the spectrum between the low and ultra-high end. Our most popular seat is the Octane Turbo which is around $775 – $1195 per seat. That’s with leather/leather match, motorized recline, and LED lighting. Octane Turbos can be configured in either straight or curved rows, as individual seats, love seats, or even as sofas.